Of all the monuments I have seen over the years and in my travels there are only two that move me to tears, one is Yad Vashem in Israel (The World Holocaust Remembrance Center) honoring the six million Jews that perished under Adolph Hitler and his Nazi regime and the other is The Vietnam Veterans Memorial in Washington, D.C.
It’s a wall. The ‘Wall’ is long and made up of solid stone horizontal panels that stretches 246 foot and 9 long and has the names of 53,318 young men and women engraved in bold letters and in neat alignment as far as the eye can see. Starting in the early sixties through 1973 each president serving our country continued to increase the number of fighting men and women to a country most knew nothing about. They were young and still wet behind the ears and that included the women, whose stories were never told until now. 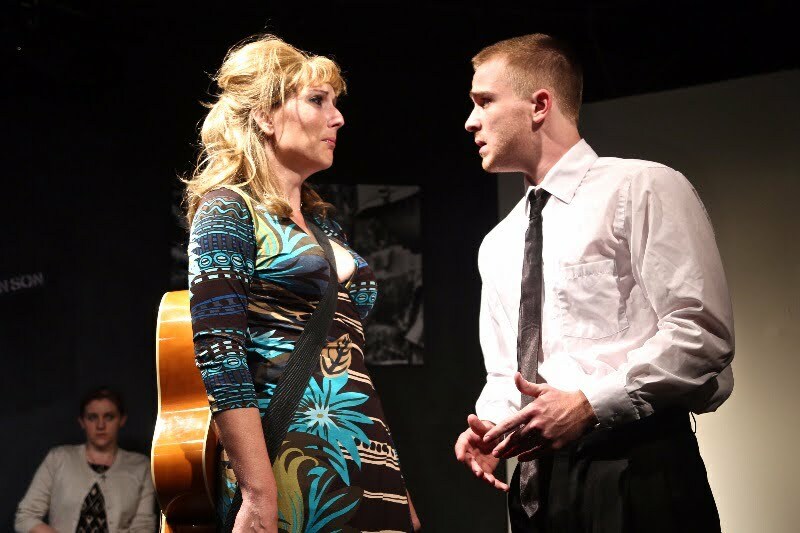 “A Piece Of My Heart” by Shirley Lauro suggested from the book by Keith Walker is currently being staged at OnStage Playhouse through Oct. 14. Beautifully directed by James P. Darvas it is a gut wrenching account of a composite of women (based on 26 interviews) who served in the Vietnam War. Lauro’s historical piece traces six women from very different walks of life and life’s experiences. It all comes alive in one unforgettable scene after the other on the bleacher like set by Hector Cisneros that looked almost as dangerous to maneuver as it was to dodge bombs in the killing fields to which they were assigned. 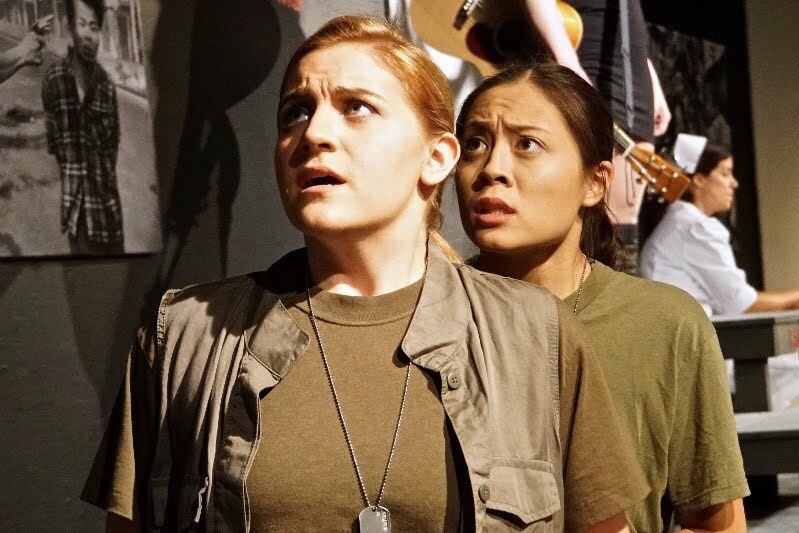 Stretching across the landscape of America, Lauro’s account of the war theatre for the six women on stage represented The Red Cross, USO, Army Intelligence, and a civilian musician is no less compelling today than it was 12 years ago. 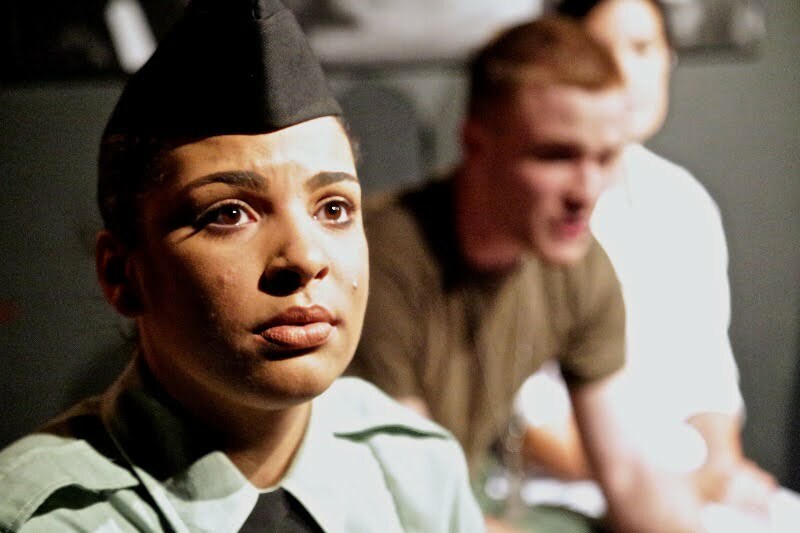 Allison MacDonald is Martha, the self controlled Army brat eager to please her family, graduated from Officers Training School when she volunteered. 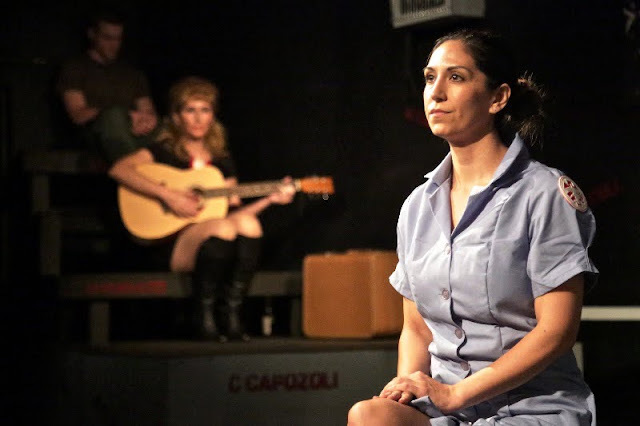 LeeAnn (Emilee Zuniga is scrappy as the reluctant recruit) was a hippie when she was recruited, She was hoping to be sent to Hawaii, where everyone looked like her but unfortunately found her self in Nam instead. Steele (a strong Ray-Anna Ranae) was a WAC for about eighteen years when she decided that volunteering for Nam would get her a better promotion when she got back to the states. As an African American, college graduate and from the deep- south, Uncle Sam was happy to have her serve, but back home no one was willing to see past her color. Sissy with strong religious leanings (no nonsense Emily Candia) was offered to become a teacher, nurse or secretary when she graduated college. She decided on nursing. And yes you guessed it she joined the Army to save the world and her do part her part to save Vietnam. Maryjo (Sarah Leclair is a talented musician playing pieces of popular tunes from the 60’s) was lead singer and rhythm guitarist in The Sugar Candies in an all girl band. Her agent convinced her that it would be fun to entertain a million boys in Vietnam. Whitney (soft spoken Carla Navarro) is the Vassar educated Red Cross volunteer who was told that two groups were being sent overseas in early summer to either Korea or Vietnam. Thinking that Saigon was sophisticated and cosmopolitan and they spoke French that she would volunteer there. Each and every one of these young women while relating their experiences take turns expressing themselves leaving pieces of their hearts, souls and humanity behind. The life altering experiences (think Agent Orange, Tet offence) as told by this outstanding ensemble shines through with each unfolding vignette comes from six different perspectives. It is an emotionally draining, transformational essay making a compelling case to rally against war, any war. They talk over each other, by each other, through each other and when confusion hits the ground and helicopters are heard flying overhead and bombs are dropping, and wounded men are being carried into makeshift hospital beds, and soldiers are dying all around and you would think nothing could be worse than the last episode they are describing when something worse happens, and they all survived to tell it. If being on the front lines was fraught with danger, and as the horror stories and pictures on TV every night at dinner time, brought us closer to the fighting wasn’t enough, coming back to a country that not only resented our being in Southeast Asia but we took it out on the men and women fighting over there as well. Being back in the States and at home for these brave women was almost as traumatic as being on the front lines. They suffered the same indignities the soldiers in the fields suffered. All six expressed frustration and anger when they realized they no longer fit in, or felt a part of society or connected with their families. Illness, drug abuse, alcoholism, depression and red tape put them on the outside once again. In a six tissue finish, projections (Mike Mccullock) of the Wall listing names of those who did not come home can be seen on the backs of the women who came to pay their respects to their fellow GI’s. Representing all the men Devin Wade is to be commended for his ability to change characters on a dime. M. Kealea Miles, Jr. designed the lighting and sound and Pam Stompoly-Ericson the costumes. It might be coincidental that Ken Burns’ 10 part series on The Vietnam War is now being shown on PBS or it might be time to reexamine our need to step in where angels fear to tread. “A Piece Of My Heart” is a must see show. Think Syria, Afghanistan, Iraq and possibly North Korea.